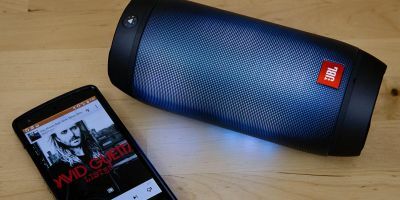 There’s no shortage of options for portable Bluetooth speakers these days, and they’re available at a number of price points depending on build and sound quality. 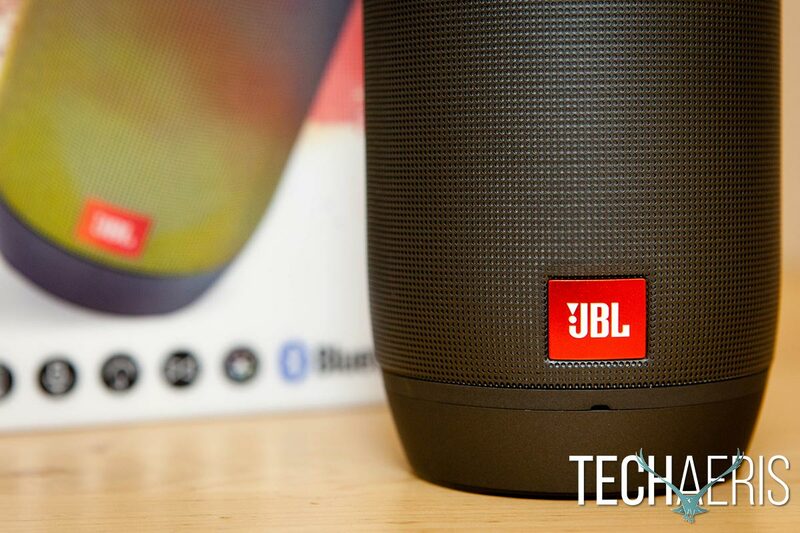 Some companies are getting creative with extra features, and JBL is no exception. 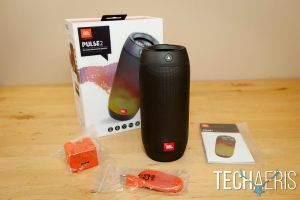 Our JBL Pulse 2 review takes a look at a portable splashproof Bluetooth speaker which also includes an interactive light show which brings your music to life. 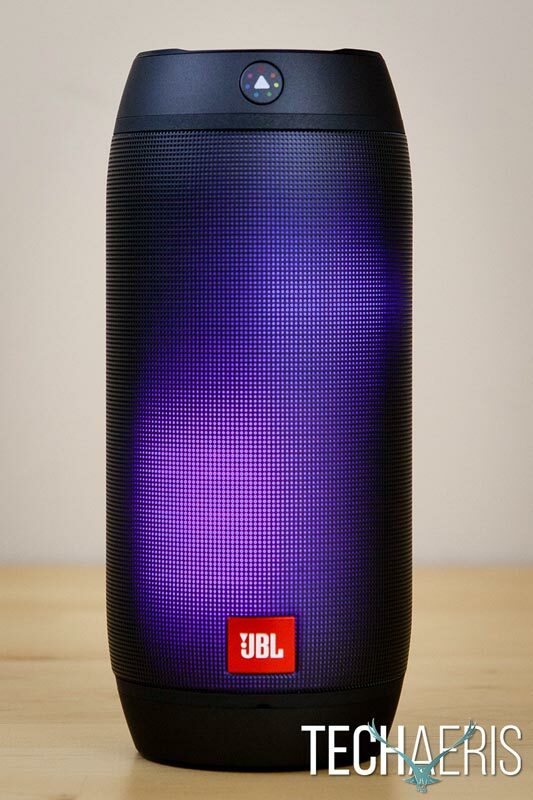 The JBL Pulse 2 Bluetooth speaker features a very attractive design. 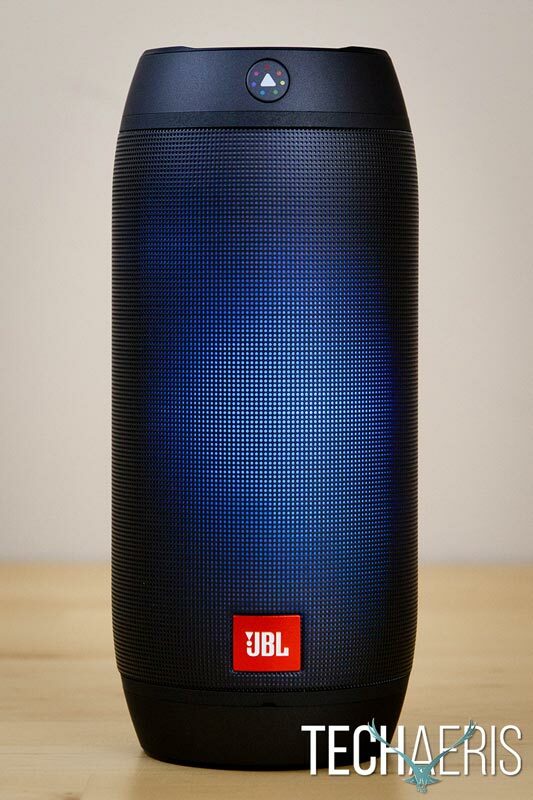 Cylindrical in shape, the speaker stands like a larger soda can. 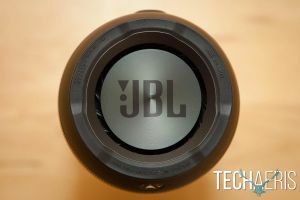 The front of the speaker features the orange JBL logo square near the bottom, and the JBL Prism Color Sensor Lens button sits near the top. The top and bottom of the speaker, which house the two external passive radiators, have a rubberized finish which wraps around the spine of the back of the speaker. 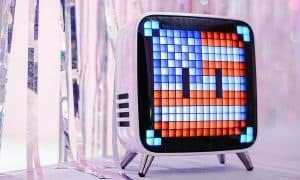 The rest of the speaker consists of a black mesh material where the customizable light show shines through. 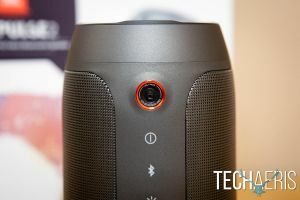 The back of the speaker is where you’ll find the JBL Prism Color Sensor Lens at the top, under which you’ll have access to the power, Bluetooth, lightshow toggle, volume, JBL Connect, and play/pause/speakerphone buttons. To the right of the volume buttons are 5 LED lights which indicate remaining battery life. Near the bottom of the back side of the speaker is a covered port which contains the microUSB charging and AUX ports. 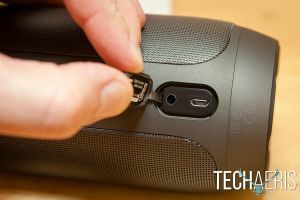 The covered port and finish of the speaker make it splashproof, and you can even rinse it off under the tap should you spill something on it. When the speaker is on and music is playing, the main area of the speaker lights up in various colours and light show styles. While not a necessity by any stretch when listening to music, it definitely makes it more visual and the speaker is definitely a conversation centerpiece when people are over. There are 8 different light show styles ranging from Fire to Rain and Fireworks, amongst others. 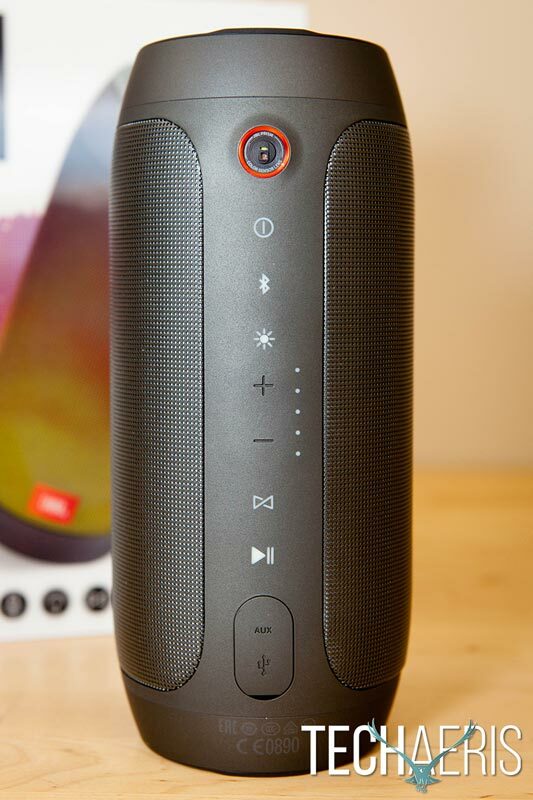 You can also set the speaker to display the light show based on ambient sound in the room when not playing music. 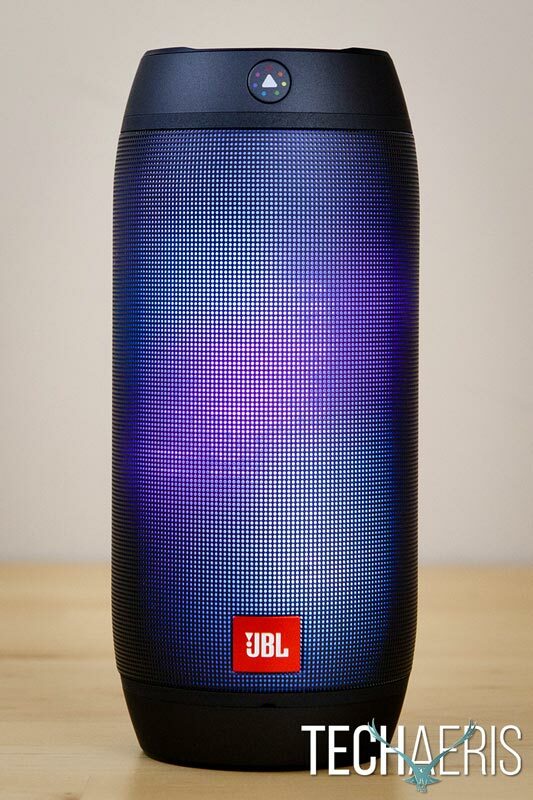 Another cool feature of the speaker is the ability to use the JBL Prism Color Sensor Lens to change the primary colour of the light show based on a wall, piece of fabric, or other coloured surface you scan with it. 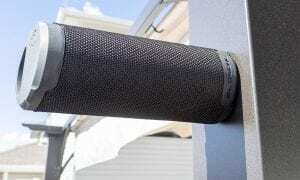 Unlike the JBL Xtreme, which we also recently reviewed, the JBL Pulse 2 can sit on one of the ends which houses one of the external passive radiators. 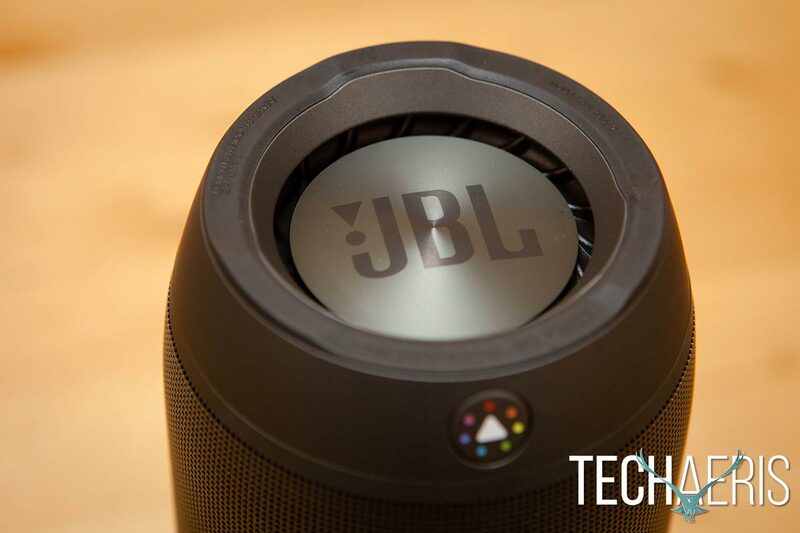 While there was a very slight sound difference when the speaker was held horizontally compared to when it was standing on a flat surface, it wasn’t enough to detract from the listening experience and you really had to listen for it closely. 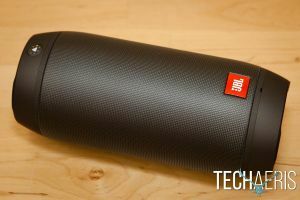 The JBL Pulse 2 has a nice weight to it, and our review unit in black was attractive and should fit nicely with any decor. The included microUSB charging cable and adapter are a bright orange that matches the JBL colours. 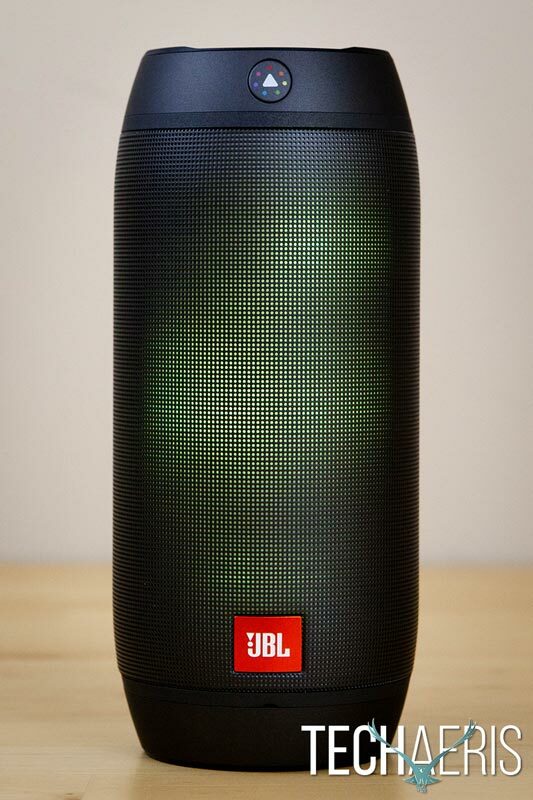 The JBL Pulse 2 is available in both black or silver. A quick note about the photo gallery below, the photos of the light show itself don’t even come close to doing it justice. 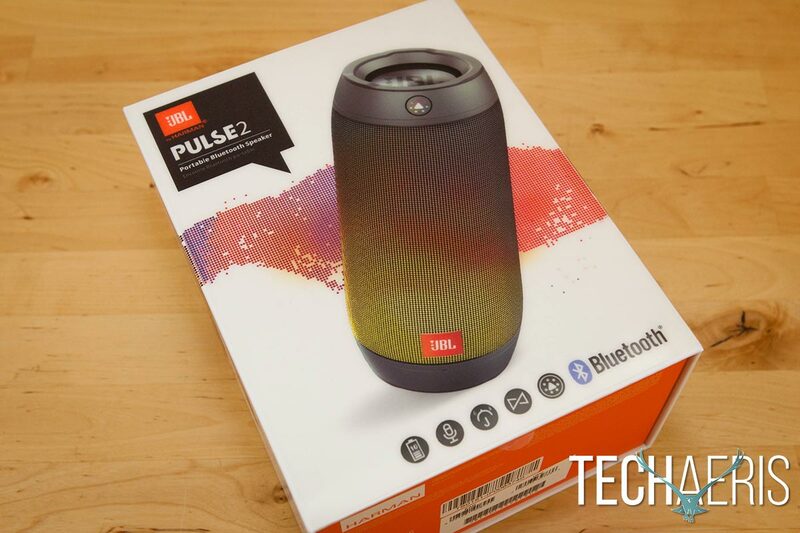 The JBL Pulse 2 Bluetooth speaker was easy to set up and use. 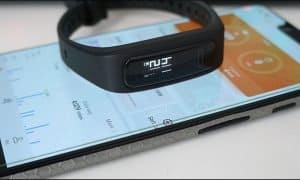 Pairing to a Bluetooth connected streaming device and the accompanying JBL Connect app was painless. 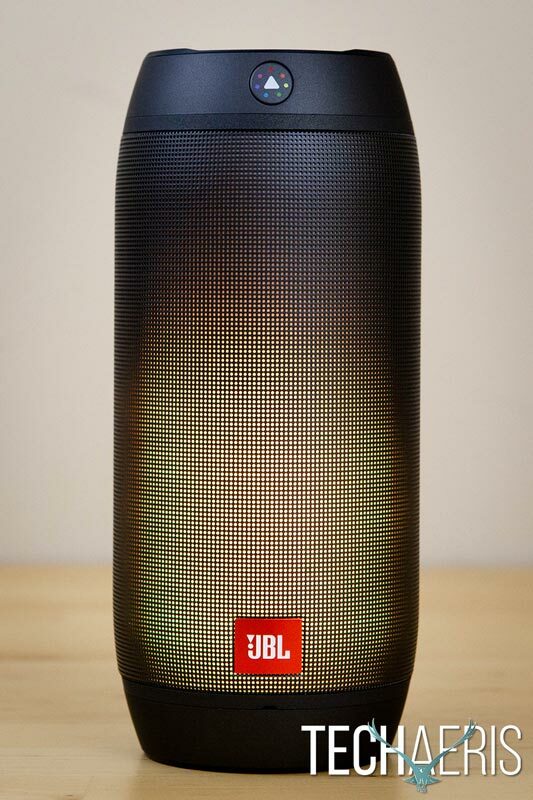 The JBL Connect app allows you to rename your speaker, update your speaker, change the current lightshow, and even connect multiple JBL speakers together. 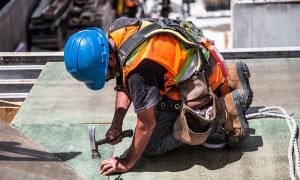 While most of these functions can be done without the app, it’s handy to have it on your phone for easier access to some of those functions. Changing through different light shows was easily done with the app, or with the correct button on the back of the speaker. In addition, holding the button on the speaker for more than 2 seconds turns the light show off for instances where you want to listen without the light show. The JBL Prism color sensor lens is a cool feature, but was pretty hit or miss. When holding the color sensor lens near a coloured object, the light show will adjust to reflect that colour scheme. 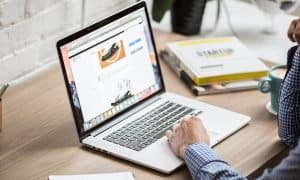 It works best with a solid colour in a brightly lit room, but there were a few instances when it took a few attempts to get the speaker to accurately scan the colour. 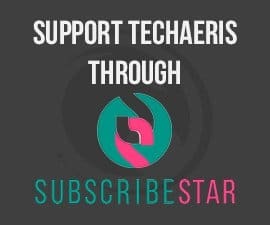 When adjusting the volume on the speaker, or on the device you’re streaming from, the light show on the speaker itself indicates the current volume with white bars starting from the bottom to top. The JBL Pulse 2 also allows for up to three devices to be connected, streaming music from each device in turn. As mentioned above, multiple JBL speakers can be connected to a single device, and we had no issues using the JBL Pulse 2 with the JBL Xtreme to stream from the same device at the same time. 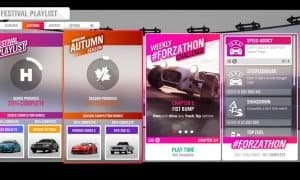 A feature we were unable to test due to having only one Pulse 2 speaker allows you to shake the primary speaker and the second (and third) connected speaker will sync to the same colour or light show the primary speaker is displaying. 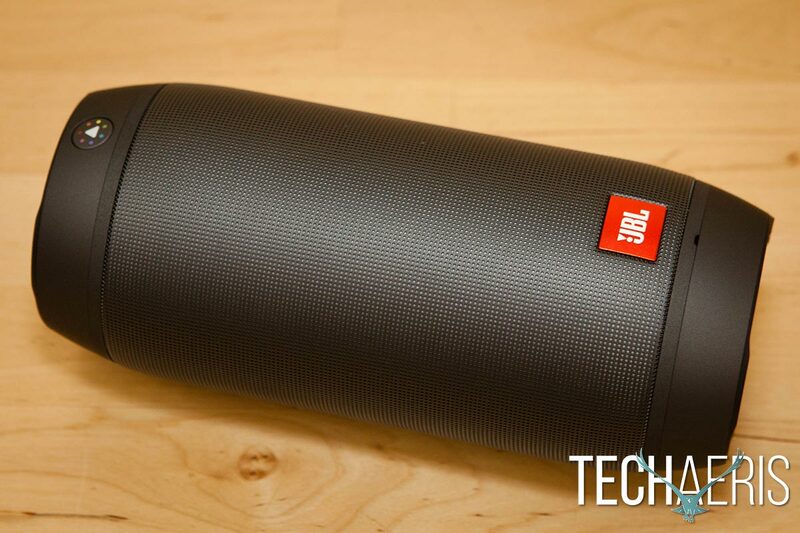 Simply put, the JBL Pulse 2 sounds excellent. 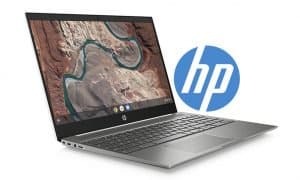 The sound output is more than adequate, and listening on full volume was too loud for normal listening. But even at max volume the sound range was fantastic and there wasn’t any distortion in bass heavy songs. 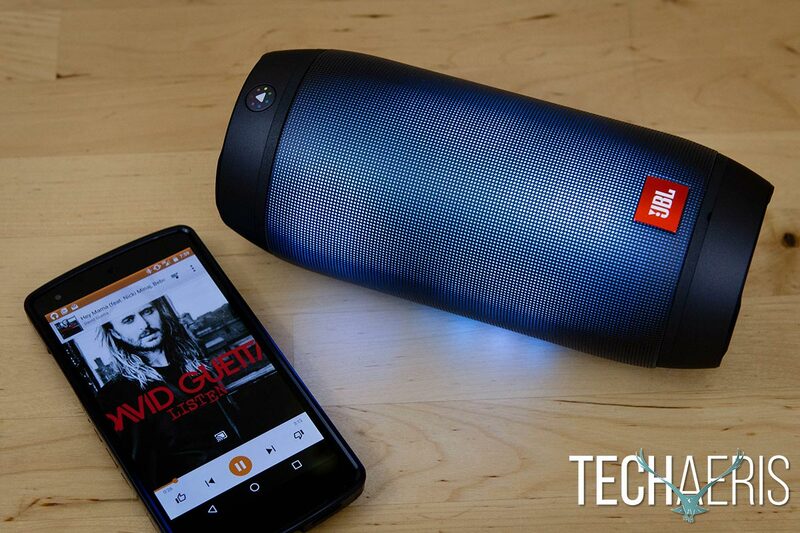 Music ranging from Top 40 to EDM, hip hop, classical, and everything in between sounded great on the Pulse 2. 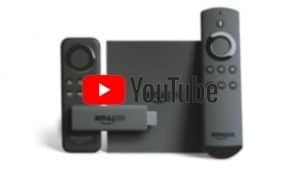 If you’re so inclined and have multiple JBL speakers which support the JBL Connect feature, you can link 2 or more speakers together and even set which is the right and left channel to cover a larger room. Most portable Bluetooth speakers these days include a microphone for answering and responding to incoming calls while the speaker is connected to a smartphone. In the case of the JBL Pulse 2, it worked well enough as a speakerphone. Naturally the closer you are to the speaker, the clearer you can be heard on the other end. JBL claims the the 6,000mAh battery provides up to 10 hours of listening and light show pleasure, and through multiple chargers we were able to hit that 10 hour mark, or just over, consistently. Of course music volume plays into this as well, and the louder you listen, the shorter your battery life will be. For some the light show is just a gimmick, but given the sound and build quality of the speaker alone, it’s worth the MSRP of $199USD. In addition, the light show is fun to watch and play with, and it’s definitely a conversation starter when you have guests over. At the time of this review, the JBL Pulse 2 is available on Amazon for $175USD which further increases the value for the price you pay. 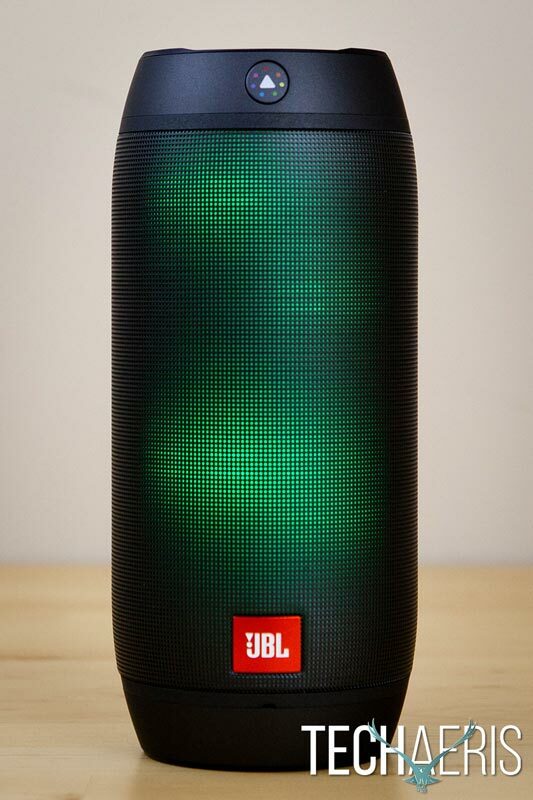 If you’re looking for a portable Bluetooth speaker that is well built, splashproof, and great sounding, you’ll definitely want to check out the JBL Pulse 2 speaker with its customizable light show — a feature that’s sure to generate conversation at your next party. 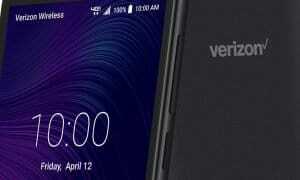 Great sound and battery life, light show is fun. 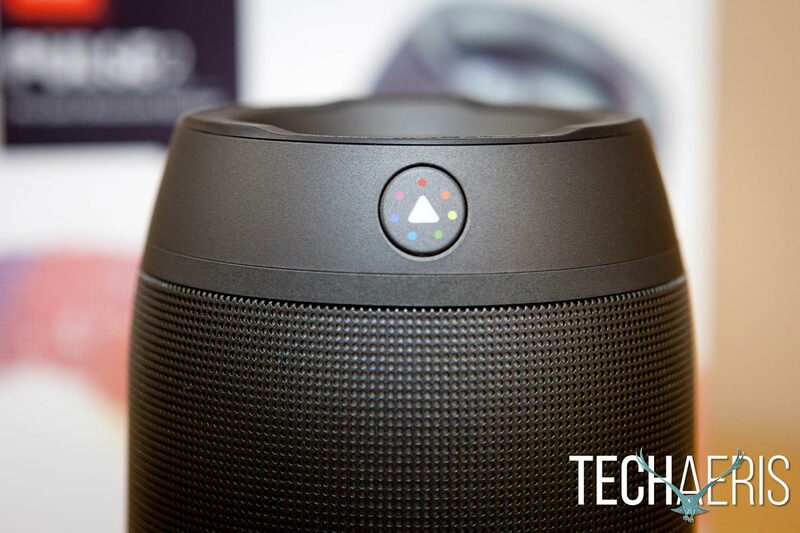 JBL Prism Color Sensor feature is hit and miss. Light show doesn't seem to really sync to the music. 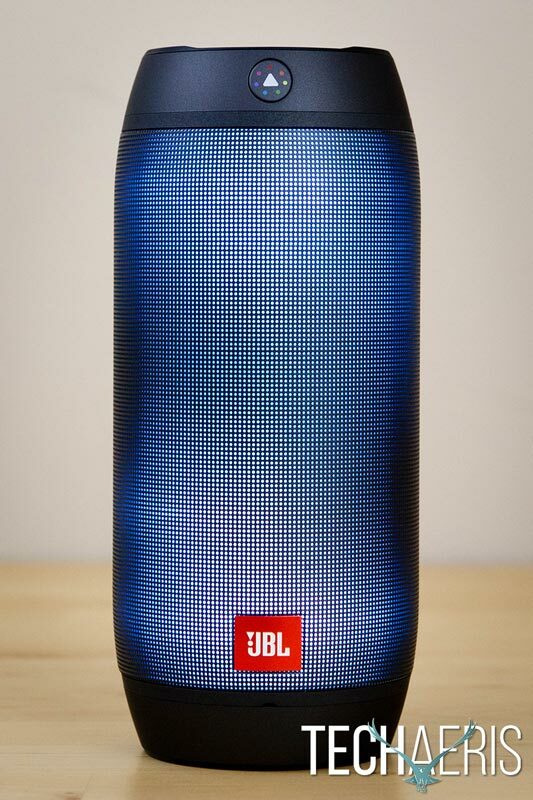 If you're looking for a portable Bluetooth speaker that is well built, splashproof, and great sounding, you'll definitely want to check out the JBL Pulse 2 speaker with its customizable light show — a feature that's sure to generate conversation at your next party. *We were sent a demo unit of the JBL Pulse 2 Portable Bluetooth speaker for the purposes of this review.